Standing for low-tech, high-touch solutions...and other relevant stuff. Welcome to my website, SimplTech. This site is currently under construction. You may access my previous website at http://ra-initiatives.tripod.com. For my work on hydraulic ram pumps, also go to http://www.youtube.com/watch?v=u2nGlnMNXrw and http://www.youtube.com/watch?v=Bb4KhL4evuc. For my work on Simplified, Non-circulating Hydroponics (SiNcH) go to http://www.bidnetwork.org/person-9478-en.html and http://www.bidnetwork.org/artefact-22005-en.html. 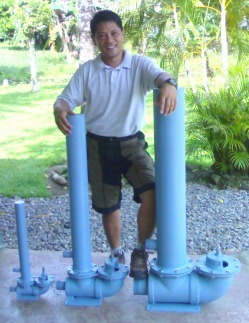 Photo at left, taken November 11, 2008, shows me with hydraulic ram pumps of my own design, a 1-inch, 2-inch and 4-inch hydram. You may also check out each page in this website for photo postings.